The magnitude 6.8 earthquake that struck Burma on Thursday evening killed 74 people and injured 111 in ten towns and villages in eastern Shan State, according to state-run MRTV. More casualties were expected amid reports of widespread devastation in the area, where many buildings, roads and bridges were destroyed by the earthquake that began at 8:25 pm local time. The strong earthquake also destroyed many houses in at least ten locations in the affected area. On Friday afternoon the state media reported that the earthquake destroyed about 300 houses and buildings, including nine government offices, 11 religious buildings and one bridge along the Tachileik-Tarlay road. 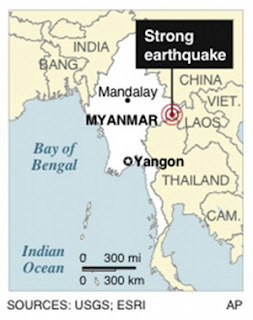 According to the state media, the epicenter of the earthquake was near Loimwe, located about 35 miles (56 kilometers) southeast of Kengtong in eastern Shan State, and the ten locations affected included Tarlay, Mong Linn, Mong Yawng and Tarchileik towns and Kyakuni, Wan Lon, Pa Line, Kong Sar, and An-khan villages. 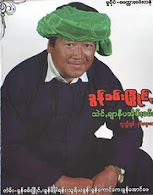 Among the affected areas, the most hard-hit was Mong Linn, where there were 29 deaths and 16 injured as the earthquake destroyed 128 houses and 5 religious buildings. The second most affected area was Kyakuni Village, where there were 22 deaths and 55 injured with 146 houses destroyed. The third was Tarlay, where there were 11 deaths and 29 injured. Tarlay is located east of Kengtong. The photos of the damaged buildings and roads in Tarlay sent this afternoon by The Irrawaddy reporter from the affected area shows that the buildings are mostly one-story wooden and brick buildings, among which a Christian church was totally collapsed. There were also reports that some people who had been in the church were killed when the church collapsed following an aftershock. 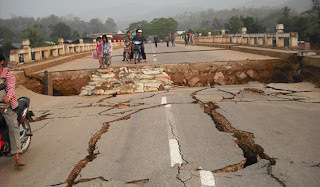 The earthquake tremors were strongly felt in Kengtong, the capital city of the eastern Shan State. Local sources said that at least 17 people, including soldiers and their families, attached to the Burmese army's Light Infantry Battalion 316, which is stationed in Tarlay, were killed or injured when a barracks building collapsed. The earthquake also caused a power outage in parts of Tachilek, where at least two electricity transformers had reportedly exploded. The residents in the border town stayed the whole night outside their houses due to the fear of further earthquakes. “The Tachilek hospital is now full of injured survivors,” said one local resident who spent the night outdoors. “People here in Tachilek and the surrounding area have been trying to rescue more people in Tarlay since last night,” he added. On Friday, the junta's security forces abruptly took control of all the roads accessing the affected areas and declared that all the humanitarian support to the survivors was only allowed through government mechanisms.